By Chris Williams: Trainer Freddie Roach believes his fighter former super bantamweight champion Scott Quigg (34-1-2, 25 KOs) is ready to use his huge punching power to defeat unbeaten WBO World featherweight champion Oscar Valdez (23-0, 19 KOs) this Saturday night on March 10 at the StubHub Center in Carson, California. 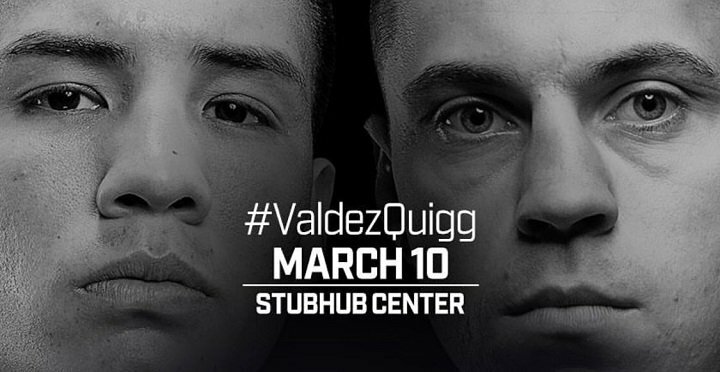 The Valdez vs. Quigg fight card will be televised on ESPN with a start time at 10:00 p.m. ET/7:00 p.m. PT. Roach believes Quigg might even score a knockout in this fight. It won’t be easy though, as the 27-year-old Valdez has changed his style to become a lot more mobile since he was badly hurt in his grueling fight with Miguel Marriaga last April. Valdez won that fight by a 12 round unanimous decision, but he was stunned twice by hard shots from Marriaga. Valdez was then subsequently hurt on a couple of occasions in his last fight against non-puncher Genesis Servania (29-1, 13 KOs) last September. Shockingly, Valdez was even knocked down by Servania in the 4th round. Valdez switched his game plan to Plan-B after the knockdown, and he spent most of the remainder of the fight on his bike, boxing the light hitting Servania. The fight showed that there’s something wrong with Valdez’s once great punch resistance. He’s now getting hurt easily and frequently. Quigg is a much bigger puncher than Servania. If Valdez chooses to stand and fight with Quigg on Saturday, we could see a quick knockout. The thing is, Qiuigg will need to finish Valdez off immediately if he gets him hurt, because he’ll start running to survive and he’ll stay on the run for the remainder of the fight like he did against Servania. Valdez is less concerned nowadays with looking good in his fights. His main focus is to win at all costs. It’s going to make it hard for Valdez’s promoters to turn him into a star because there aren’t too many fans that were thrilled with the way Valdez fought against Servania. If Valdez has to fight like that all the time in order to run, he’s not going to impress too many boxing fans. Quigg, 29, will need to apply a lot of pressure on Valdez by cutting off the ring and unloading on him against the ropes. Valdez is as slippery as an eel nowadays. He doesn’t let himself get trapped too often. It was a strange sight to see Valdez running from a light hitter like Servania last September, but he had to. Valdez was getting hurt by Servania every time the two would exchange. Whatever punch resistance Valdez once had, it’s gone now. I think Marriaga shook something loose with one of his big right hands that he hit Valdez with last year in their fight in April. Valdez’s ability to take a good punch is gone. Now he’s incredibly fragile in taking shots, and he’s turned into an ugly runner. “The thing is – a lot of people don’t understand the power he [Quigg] has. He has tremendous power also and I wouldn’t be surprised if he knocks this guy out,” Roach said. There’s no question at all about Quigg’s ability to win this fight. If Valdez stands and fights Quigg on Saturday, he’s going to get broken down and stopped within 6 rounds or less. Quigg has too much power, and Valdez’s chin is absolutely gone. I don’t think Valdez’s ability to take a shot is going to ever come back. If he stands and makes a fight of it against Quigg, it’s over with for him. Top Rank will need to go in another direction at featherweight, because Valdez is not going to be the star they thought he was after he turned pro in 2012. The 2-time Mexican Olympian Valdez looked like a world beater when he turned pro. Valdez breezed through his first 21 fights without a loss, beating weaker punchers and looking like a devastating fighter. The problem is Valdez was being matched against non-punchers during that part of his career. He could afford to stand in front of them and unload his power shots without having to worry about getting clipped by a big shot from his opposition. Since Valdez always had a lot more punching power than the weak punchers Top Rank was throwing into the ring with him, he was able to blew through them and look sensational. Valdez looked better than he actually was though. Once Valdez was put in with a fighter with some power in his match against Marriaga last year, we saw the wheels starting to come off. Valdez is now looking very vulnerable to taking head shots. Top Rank feels he’s fine and will get past Quigg with no problems. The reality is going to be much different. If Quigg is able to trap Valdez and force him to fight in a one-on-one battle like he used to do when facing the weak punchers in his first 21 fights of his career, then he’ll likely knock him out. If that happens, I don’t know what Top Rank will do with Valdez. You can’t move him down to super bantamweight, because he’s too big. He’s likely struggling just to make 126. Valdez looks more like a boiled down super featherweight to me. If Valdez moves up to 130, he’ll have to deal with the punchers in that weight class like Alberto Machado, Miguel Berchelt and Kenichi Ogawa. I doubt that Top Rank will let Valdez get anywhere near any of those guys though. What will likely happen is if Valdez is knocked out by Quigg, the loss will be blamed on his weight. They’ll say that Valdez has been struggling too hard to make featherweight and he needs to move up to super featherweight. Current WBO 130 lb. champion Vasyl Lomachenko is on the verge of vacating his title and moving up to lightweight. Conveniently, Lomachenko is also with Top Rank. So, Lomachenko will vacate his WBO super featherweight title, and the beaten Valdez will move up and fight for the vacant WNBO title against one of the top contenders. It’s all so predictable.